Powers: He has superhuman strength, endurance and near invulnerability. He is also well versed in many forms of hand to hand combat. Dante started his adventuring career in the mid 70’s at the advent of disco. He continued through the 80’s and into the early 90’s when an accident ended his career. Dante was believed to have been a mentor to Teri Vaughn during her hiatus from the media. 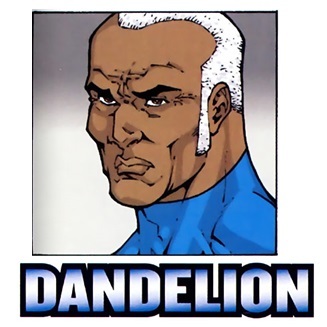 As co-producer and trainer, dandelion now leads his superhero expertise to Wildgurad [Wildguard Insider #1].